It is time for the final vote. I have already given you my opinion on the finest performers when it comes to individual desktop environments - Plasma, Xfce and even Gnome, but now, following in the best of our annual traditions, we need to vote on the most complete, most successful distribution of the year. Unlike the desktop environment votes, it will not be purely based on the final score. I will also incorporate other elements - how deeply has a particular distro charmed me, whether I have continued using it after the initial review, how it has evolved, and of course, the critical stability, support and friendliness parameters. And then, there's your vote, too. So let's run through the coveted shortlist. To wit, the 2016 elite. I am not going for any particular desktop environment, but the Xfce and Gnome versions both deserve equal mention. During the year, I managed to get CentOS 7.2 running on my evil G50 laptop, and since I have spent a lot of time playing with it. The initial setup was somewhat long and difficult. But the distro was wonderfully predictable in its behavior and extremely cooperative with my tweaking attempts. Nothing I did needed a second take, and fixed things would stay fixed. No regressions. In the end, I had an extremely beautiful and balanced Linux to play with, be it either one of the two environments, offering style and elegance, all the modern amenities people need on their desktop, all the fun stuff you expect and get from Ubuntu, Mint and alike. I also enjoyed a very high level of stability, excellent performance and a very decent battery life. The only downside, going back to the starting point, is that most of what I achieved required a conscious, non-trivial, non-newbie effort to prepare and configure, which is what makes CentOS ultimately adorable but paradoxically not as immediately friendly as your typical distro. Even so, the fact you can run it with Numix icons, and have iPhone mounted without too much fussing surely speaks greatly of this server system. MX Linux is an ugly duckling of the antiX & MEPIS orphanage, but it turned out to be a very lovely product, with some cool, unique features. It had some rough edges, as you would expect from a niche Xfce offering, but it more than compensated for the little niggles and warts with excellent performance, excellent battery life, everyday needs nicely ticked, and then some special extras the likes of having your live session data committed to the disk, MX Tools, and then some. Not something you would expect Dedoimedo to write, but it only shows how wild and unpredictable the world of Linux truly is. Arch is my arch-enemy. Not really, but I did actually spend an afternoon writing an article, telling you why and how I would not really consider stock Arch for a review. No stock Arch, but Arch derivatives? Definitely. Manjaro is another example of an anti-hero made the good guy by the fourth season. Initial attempts were rough and gruff, and I was not pleased with how it behaved and what it did. Paralleling my experience with Xubuntu over the years, Manjaro stopped being a pointless derivative and gained personality as well as popularity, and the old stuff disappeared. Instead we had a solid, mature, or at the very least, maturing distribution, offering a well-balanced basket of everyday goodies, stability, speed, and electronic juice for when the charger is away. What makes it even more interesting is the implementation of some of the bleeding-edge stuff, and the positive trend of continuing improvements. I had the brush with Manjaro twice this year, and it is very nice to see that it had managed to build on the solid foundation, and then add to it. Version 16.10 Daniella is the latest entry, and it offers a splendid non-mainstream choice, which is all the more intriguing given its background. Let's dive into your ballots. As always, I ran a two-week poll, allowing you to share your view on the distro winners of 2016. For practical purposes, the poll was limited to the top 10 entries on DistroWatch, but there was also a free-text field for everything else. The poll turned out to be quite popular, with roughly 1,800 votes in the first day and more than 2,000 votes within just three days, exceeding our previous attempts. But then, some people were naughty and had voted more than once, despite my polite plea. I had configured the poll with a very basic IP/cookie restriction, which is quite easy to work around, and for some odd reason, a few people chose to exercise this option. This only makes for a sweet, temporary illusion. It does not change the reality. Technically, the winner is Other, with 593 votes, but the breakdown is different once we look into this specific vote category. Arch (all spelling versions thereof) received 122 votes closely tailed by Antergos, which was granted a handsome 93 thumbs up from the community. 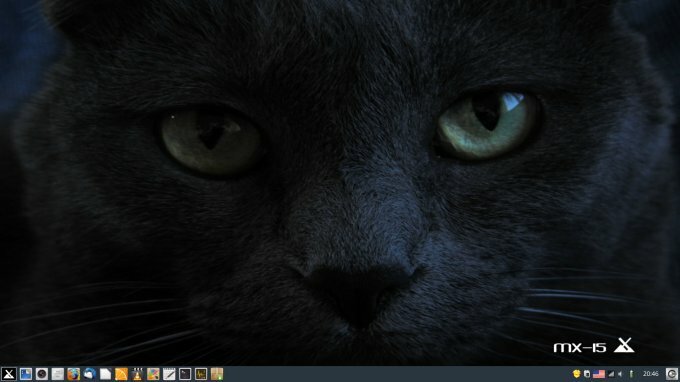 Then we have the Solus, Xubuntu and such. 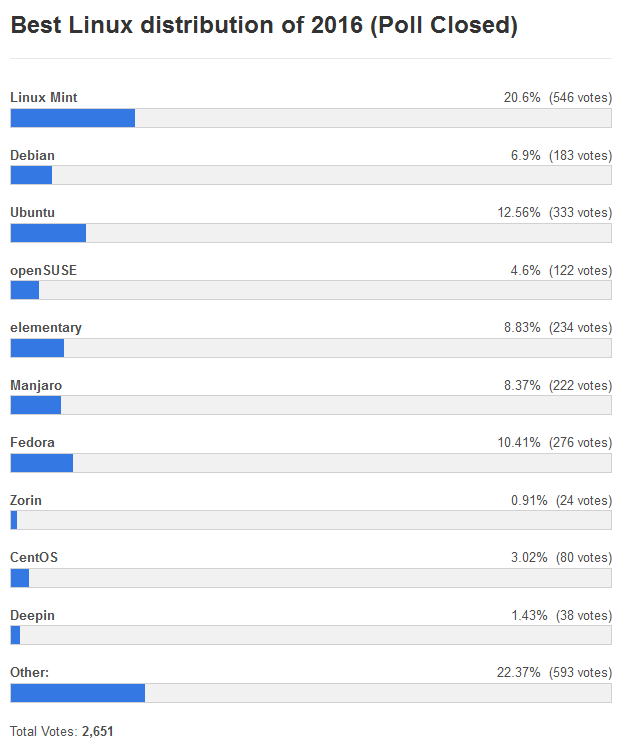 With the number normalized, it is still Linux Mint in the top position (20.6%) votes, Ubuntu has edged up into the second place with 12.6%, and Fedora is a lurker that showed some rather promising results this year, harvesting 10.4% love from the people. Compared to 2015, Arch has slid down somewhat, OpenSUSE, Debian and CentOS are holding steady. It was a turbulent year, but not much of a revolution. Now, my vote if you please. Blimey, guv, we actually have two winners! First, from a purely dry, factual perspective, it's Linux Mint 17.3 Rosa Xfce. It delivered flawlessly. 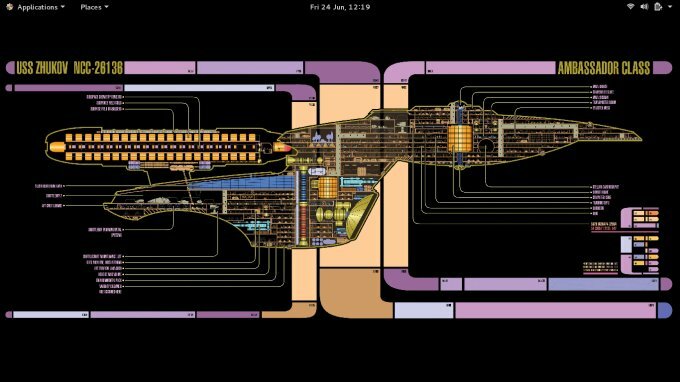 It was fast, elegant, stylish, stable, modern, beautiful. It came loaded with all the goodies out of the box, it never once hiccuped, and even the Nvidia driver setup was quick, simple and painless. 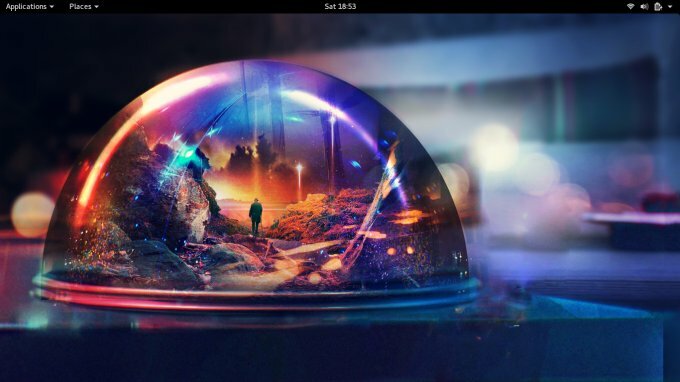 If you are looking for a fire-and-forget solution to all your computing worries, and you are keen on Linux, Rosa Xfce set the bar as high as it gets. From a usage perspective, it's Fedora 24 Gnome. Never once had I believed that Fedora would rise so highly, but rise it did. Not only is the 24th release a child of a long succession of slowly, gradually improving editions, it also washed away my hatred for Gnome 3, and I actually started using it, almost daily, with some fairly good results. Fedora 24 was so good that it broke Fedora. The latest release is not quite as good, but it is a perfectly sane compromise if you want to use the hottest loaf of modern technology fresh from the Linux oven. 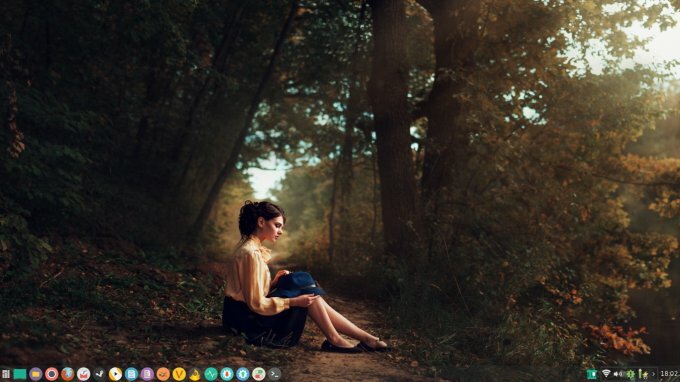 Fedora 24 is spectacularly sweet. Stable, fast, with a great battery life, and it gives me all the things that I expect, albeit with a little bit of extra legwork - sharing is caring, media codecs, smartphone support, everything else. Unexpected. Amazing. The crazy way 2016 turned out to be. And so the community and I are in an agreement, w00t, we both have Mint and Fedora as our top choices. Blimey, guv indeed! Am I boring you? Yes, I probably am. Because the five contestants include four Xfce and two Gnome entries. Not a typo. You may ask, what about Cinnamon, what about Unity? Where is Ubuntu? What happened to SUSE? Did you not love Plasma once upon a time? The answer is: Linux. So much has changed in one year. So much drama, turbulence, broken dreams. 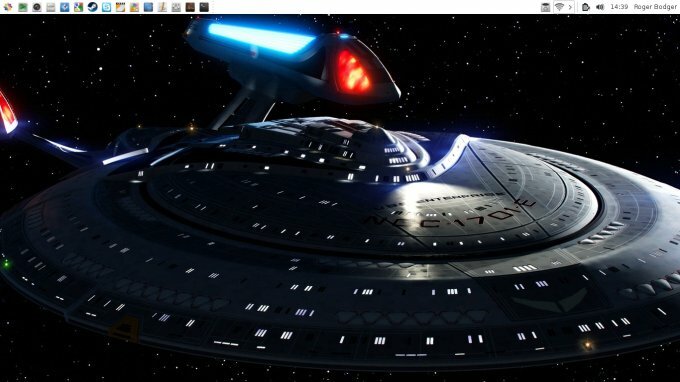 And yet, the desktop remains pretty much as it was, unchanged, with the same approach, for better or worse. Market share, penetration, fragmentation. The one big difference is that the players of yore have been replaced with some new candidates, eager to prove themselves. Do not get me wrong, my production setup still runs the venerable Ubuntu 14.04 Trusty, one of the most refined operating systems in the past half a decade. And yet, my eye is wandering about, appraising all these new fine Linux hatchlings. Manjaro, Fedora, MX Linux, I would not have really given them much thought only twelve months ago. But much like in nature, Linux will find a way to restore the balance. Ultimately, Ubuntu 16.04 failed to be the splendid LTS we hoped for, and as a result, it dragged down a whole range of distributions with it. Mint is also suffering because of this, but one man's misfortune is another's moment of glory. Or something. We are also seeing the renaissance of Gnome, and Xfce is plodding along like a tank, unstoppable. Exciting. Liberating. The fear of ending up with no viable solution to the Linux desktop is a real one. But for now, there's hope. Fedora is there, Mint, should anything fail, will always have its Xfce joker, and and there's a bunch of young blood, waiting, lurking. Interesting times. See you in 2017. P.S. If you like this article, please support Dedoimedo.